This entry was posted on Wednesday, January 14th, 2009 at 2:47 pm and is filed under Confusion & Deceit, Credence good Cheaters, Greatest lies are told in silence, Information sharing, Lawyers as businesspeople, Organized crime, Predatory franchise lending, Shame - Humiliation, Sunk Cost Reality, Writers. You can follow any responses to this entry through the RSS 2.0 feed. You can leave a response, or trackback from your own site. No, not in jail, but still creating havoc. I suffered a catstrophic head injury in a motor vehicle accident on September 18, 1994. In the 16+ years post-accident I’ve been bounced from pillar-to-post by four law firms. The first law firm withheld material information and failed to disclose it represented the insurer and the company that acquired my insurer at the material time. The second law firm withheld material information and failed to disclose the principal partner was, in fact, a founding director and major shareholder of the company that acquired my insurer at the material time. The third law firm refused to commence legal action against the first two law firms with respect to the independent actionable wrongs perpetrated above and beyond the original litigation based on a contract of insurance. The fourth law firm professed to recognize two distinct causes of action and then betrayed my legal cause and abandoned my legal rights by allowing limitation periods to commence legal proceedings run out of time. The Law Society failed to investigate the initial complaint against the first two law firms in any meaningful way. Further, when the matter was appealed to the Compalints Resolution Commissioner, Mr. Abdul A. Chahbar, the appeal was dismissed and the file was closed. The Law Society has a mandate to govern the legal profession in the public interest, in theory, so Ontarians can have an ‘independent bar’. In fact, the Law Society knowingly betrayed the public trust when they appointed Mr. Chahbar to the office of Complaint Resolution Commissioner. Mr. Chahbar was in a disqualifying conflict of interest when he dismissed my appeal on March 12, 2003. Mr. Chahbar’s connection to LPIC at the material time is verified by the Law Society of Upper Canada ‘Minutes of Special Convocation’ Thursday, 31st of July, 2003. Mr. Chahbar is listed as, Member, LPIC Board of Directors, Vice-Chair, LPIC Audit Committee, Member, LPIC Sub-Audit Committee, Member, Law Pro Board of Directors and, Member, Law Society of Upper Canada Government Relations Committee. The operative word for such activity is ‘racketeering’. Mr. Slayton’s book just scratches the surface with respect to the culture of corruption entrenched in the Law Society of Upper Canada. Back in 1990, when the Law Society was confronted with an ‘insurance crisis’, they took it upon themselves to organize and incorporate the Lawyer’s Professional Indemnity Company (“LPIC”). LPIC is a conflicting financial interest that impinges on, and alters, the ability of the Law Society to govern the legal profession in the public interest and, a betrayal of the public trust. Mr. Chahbar was receiving a financial benefit from LPIC at the material time. By 1994, LPIC was facede a $200 million deficit. The Law Society hired Malcom Heins, a lawyer and former President & CEO of Simcoe-Erie Insurance, a large professional liability insurance company, to take over as President and CEO of LPIC. Further, the complaint and appeal process available to members of the public with legitimate complaints against members was ‘rigged’ in favour of the Law Society’s wholly owned insurance company subsidiary. Essentially, every complaint file Mr. Chahbar closed and every appeal Mr. Chahbar dismissed was one less claim against a policy of professional indemnity insurance issued by LPIC. The mandate of self-regulation granted to the legal profession by the people of Ontario pursuant to the Law Society Act should be revoked immediately and replaced with a system of independent oversight that is truly in the public interest. On February 13, 2009 I was compelled to commence a legal proceeding against the fourth law firm without the benefit of counsel. I have been shunned by the legal profession because the defendants are lawyers. 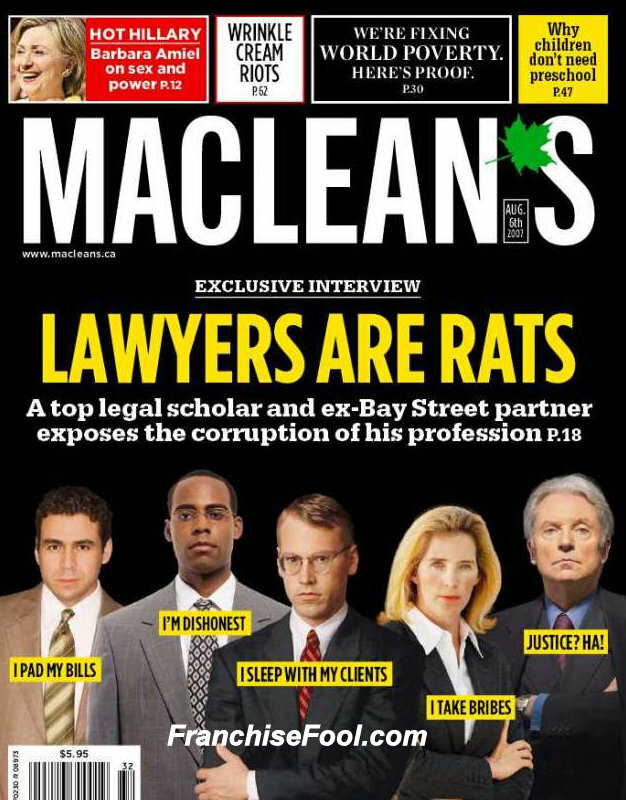 The corruption in the Law Society of Upper Canada is out of control. I hereby call upon the government of Ontario to initiate reform the Law Society Act and a system of independent oversight of the profession in the public interest. Just as BIG business has taken over Main Street small businesses, BIG LAW and the drive for profits for BIG LAW now deprives ordinary citizens of the ability to address the courts in pursuit of justice. The majority of judges are the product of BIG LAW who have instructed the Judges on the importance of survival of BIG BUSINESS and BIG LAW. When “the rule of law” is influenced and written to favor Big Business and Big Law, who work together, the average citizen can’t afford to address the courts. What is determined to be “the public good” is determined by Big Business and Big Law. I admire your courage and I would hope that the people of Ontario, through their legislators, would be interested and protest —but, unfortunately, the public doesn’t know what is going on and will not be educated as to what is going onl “Outrage” and “shock” is out of style and the “editorial voice” of big business, supported by big law, seeks to keep the public ignorant. It is the lawyers, of course, who drive the getaway cars and who determine what judges will sit in the courts. Here is a statement from the one presidential candidate who actively supports the legalization of medical marijuana nationwide! “Patients receiving cannabinoids [smoked marijuana and marijuana pills] had improved immune function compared with those receiving placebo. They also gained about 4 pounds more on average than those patients receiving placebo.” You can read more and support her campaign on her site http://denisebedio.com/marijuana. Join us and together, we can create a true land of the free. about skin colour or gender has to stop. The good old boys club still exists and I know all about being marginalized by government officials and lied to by supposed associates. I wish you well and don’t give up the fight. We do have a world wide problem with our legal profession and just as with rats the lawyers learn very quickly ow to avoid traps. When they loose all principals towards caring for the family unit and only maintain the principle of the pursuit of more money the whole world has a problem. It means that decisions are no longer made on the basis of right or wrong but on the basis of increasing the money flow. As with the fable of Midas, when we only left with gold and life and love have disappeared we may as well be dead. In www,lawyersorgraverobbers.com we discuss the failure of the law in Australia to acknowledge family as the primary building block for our civilization, unfortunately Australia has never formed a treaty with its original inhabitants and has ignored the significance of family within its legal structures. Nowhere in this post do we even discuss the solution to this universal problem. Boredom, arrogance and greed are discussed – all good points. Should we be repairing the law to make it less manipulable? Should we have judges with balls/empowerment to call the obvious law-scoff and legal bully when they saddle the already overbusy court resources? Why is this a seemingly universal human condition? We all want justice, we all know what it looks like, those who practice it aren’t interested in providing it so it is nowhere to be found. Our race universally agrees on right vs wrong but nobody can get justice to their moral dilemmas. If lawyers are some of the world’s smartest thinkers (I believe they are) and they can’t solve this universal problem of injustice/inaffordability etc, then we are wasting our time talking to the wrong people. It could be, the human/moral problem is a “religious” problem rather than a problem with the system, the Rules, the politics or the access.